Bear McCreary is an American composer and musician living in Los Angeles, California. He is known for his work on the re-imagined Battlestar Galactica television series. McCreary was born in Fort Lauderdale, Florida, and spent most of his formative years in Bellingham, Washington. He is the son of author Laura Kalpakian and professor Jay McCreary of University of Hawaii. He is of Irish and Armenian descent. He studied under the renowned film score composer Elmer Bernstein at the USC Thornton School of Music, during which time he reconstructed and re-orchestrated Bernstein's 1963 score for Kings of the Sun. Their collaboration allowed for the complete score to be available as a soundtrack album for the first time in forty years. From 1998 until 2005, McCreary built up a body of work scoring short films. McCreary is a pianist and a self-taught accordionist, and plays in the avant-jazz band 17 Billion Miles of DNA. 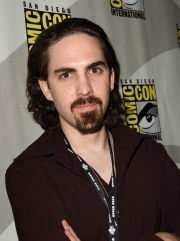 McCreary is married to singer/songwriter Raya Yarbrough, with whom he worked on the music of Battlestar Galactica. Whole or part of the information contained in this card come from the Wikipedia article "Bear McCreary", licensed under CC-BY-SA full list of contributors here.